New Ag International is bringing a week of high-tech agriculture to Dublin next month, March 25-29th . Covering the latest developments in plant nutrition, smart fertilizer, biostimulants and digital agriculture, this series of events offers a unique opportunity for attendees. The week will bring together three conferences and two exhibitions under one roof at the Citywest Hotel, the largest hotel in Ireland. The week begins with the InfoAg International Conference and Exhibition running alongside the IFA/New Ag International Conference on Slow- and Controlled-Release and Stabilized Fertilizers, which currently runs every three years. These three-day events run March 25-27. Following many years of success in the USA, the organizer of InfoAg is partnering with New Ag International and coming to Europe to create the premier event for the discussion and advancement of precision and digital agriculture. Subjects to be covered include looking at in-field monitoring with imagery and sensors, seamless connectivity with IoT, data analytics and prediction modelling, variable rate technology and prescription platforms. The week will finish with the 17th edition of the New Ag International Conference and Exhibition, March 27-29 where more than 500 delegates are expected. The conference program will cover the latest trends and products in plant nutrition, soil and crop health. Combined with the exhibition, the event brings together decision makers from the specialty fertilizer, biostimulant, fertigation and precision ag industries. 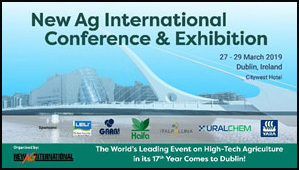 New Ag International looks forward to welcoming attendees to Dublin in what promises to be a truly stimulating week on high-tech agriculture. More information about all of these conferences can be found on the New Ag International website.